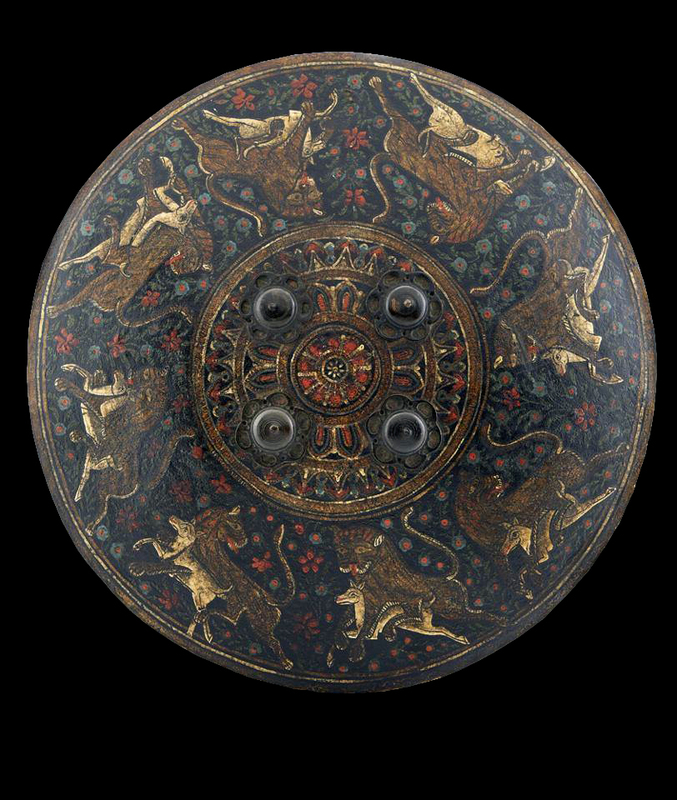 Indian Leather Dhal,Hippopotamus/Rhinocerous skin, painted on the outside with zoomorphic, vegetalist and geometrical scenes, having in its central area 4 rosettes in worked and perforated bronze, which support 4 iron rings on the inside of the shield. The shield shows signs of use. Escudo indiano "Dhal", do séc. XVIII/XIX, em pele de hipópotamo/Rinoceronte curtida, pintada na parte exterior com cenas zoomórficas, vegetalistas e geométricas, em tons polícromos, tendo na parte central 4 rosetas em bronze recortado e vazado, que servem de suporte a 4 argolas em ferro, situadas na parte interna. Sinais de uso.